Church attendance is declining in the West today as more and more people declare that they can have God without His church. How did we get here, and above all, how do we move forward? In The Church, the timeless spiritual leader A. W. Tozer discusses the nature and mission of the church and how ordinary Christians can and should participate in the life of the church. Tozer offers you far more than theological platitudes or "should's" and "should not's." With matchless eloquence, Tozer proclaims the simple truths of the faith in way that moves you to astonishment and compels you to worship. Come and be reminded of what it means for the churchto be faithful, and why it is so wonderful that we get to be a part of the glorious bride of Christ. 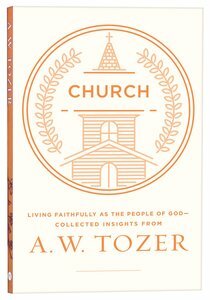 About "Tci: Church: Living Fully as the People of God - Collected Insights From Aw Tozer (Aw Tozer Collected Insights Series)"